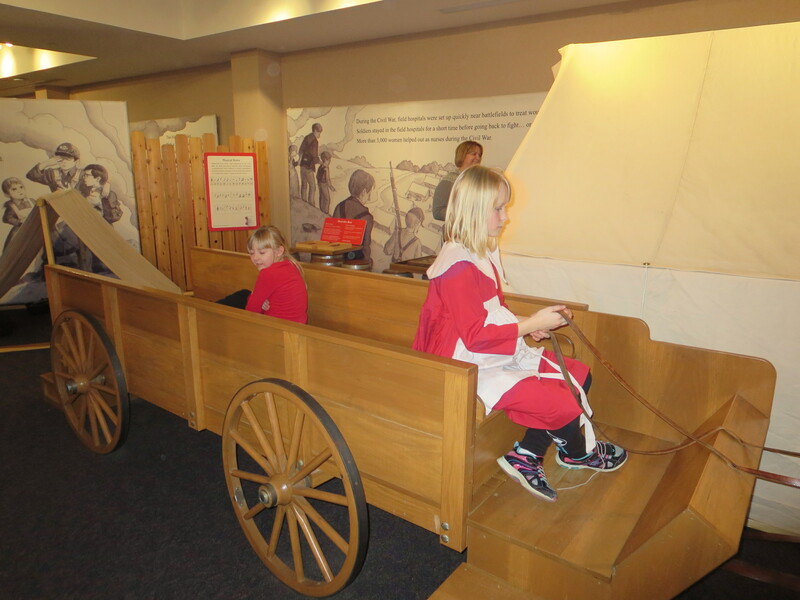 A few weeks ago, I accompanied my daughter and her third-grade class on a field trip to The 1820 Colonel Benjamin Stephenson House. Having recently visited Conner Prairie, an interactive 1800s historical park, it was nice to view a similar piece of the nineteenth century, one located in our own backyard. 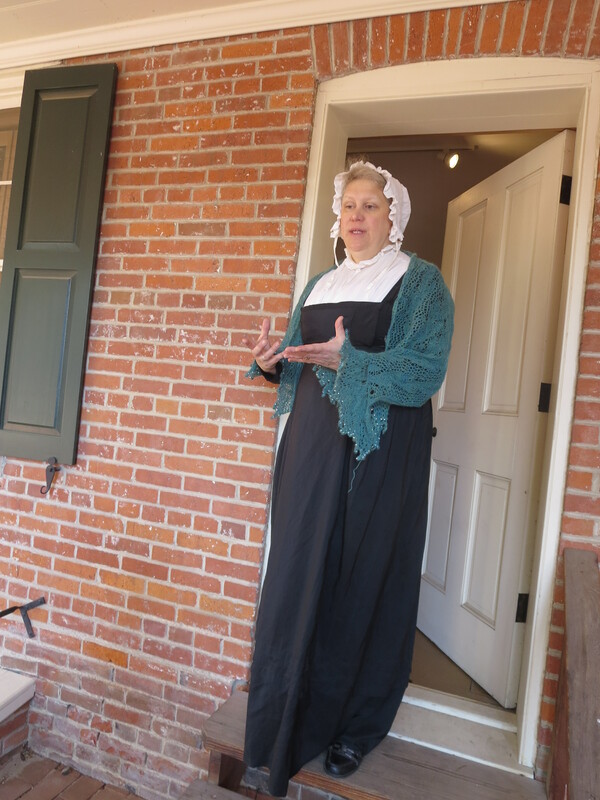 Upon arrival, no time was wasted (which I like) as our group was led into the orientation room by a female docent dressed in period clothing. 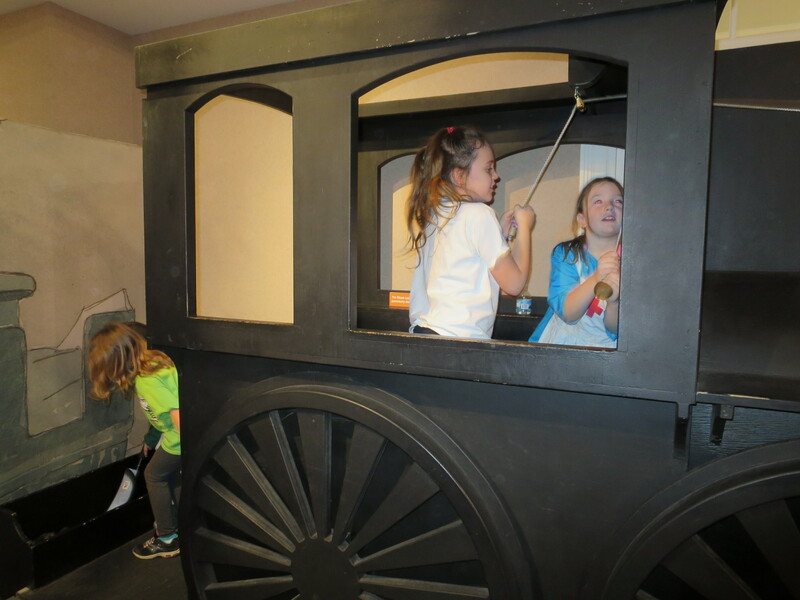 Here we viewed a video explaining the history of the Stephenson family in Illinois, highlighting their time in Edwardsville and this Stephenson House. Once the video was complete, we were ushered outside where a male docent (again, in period dress) with quite a sense of humor explained the architecture of the house both inside and out. From there, our group entered a separate building which housed the kitchen. Educating us on the particulars of canning and food preservation, students were given the opportunity to string beans for drying above the fireplace and tamp down the cabbage for the purpose of making sauerkraut. Our final station consisted of learning how water was transported by the use of a shoulder yoke and how those living in the 1800s cleaned their clothing. Again, this interactive tour allowed students to try on a shoulder yoke as well as stir the laundry in the boiling pot and attempt to remove stains by the use of a washboard. Disappointed our tour had come to an end, I look forward to revisiting the Benjamin Stephenson House while my daughter looks forward to Mrs. Lucy’s Academy for Young Ladies, a summer camp offered at The 1820 Colonel Benjamin Stephenson House. 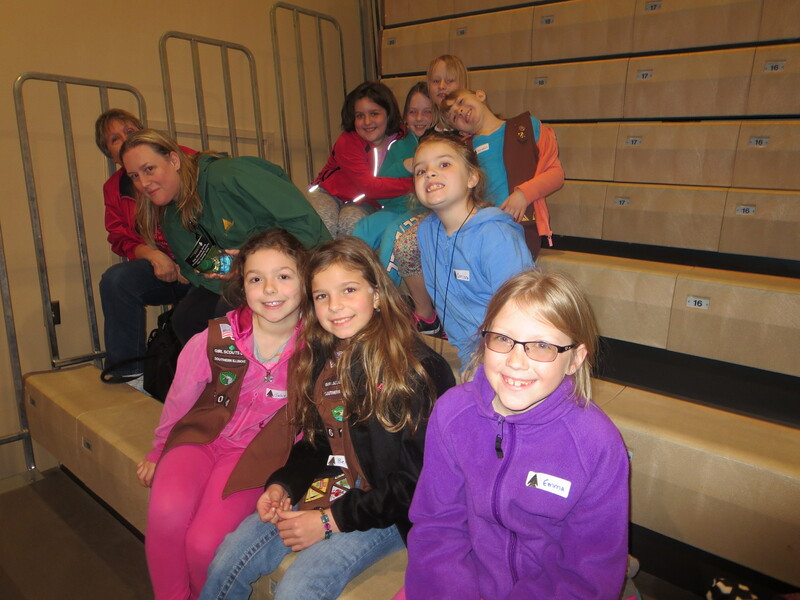 Looking for a three-hour plus educational adventure for your Girl Scout? Look no further than a field trip to Cahokia Mounds, designated a World Heritage Site by the United Nations Educational, Scientific, and Cultural Organization. Beginning with an engaging performance by The Kahok Dancers, the Brownies not only watched The Pipe Dance and The Eagle Dance, they participated. Quite the workout if I do say so myself . . .
From there, our group, Arrowhead, headed to our crafts/games session. The girls began by rubbing copper-colored tin wrapped around tiles with Native American imagery. 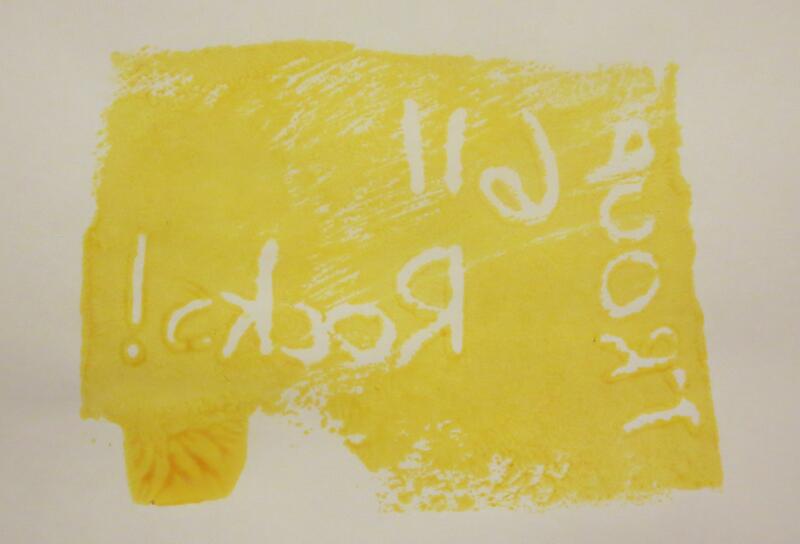 The completed rubbing was then transformed into a necklace. Once this was finished, girls then used their hands to form clay into a bowl similar to those seen in the museum. The games portion consisted of learning how to throw spears using two different devices. One of our Brownies, Miss G., found her calling as a future javelin thrower as she was able to throw further than any other adult or child in our group. 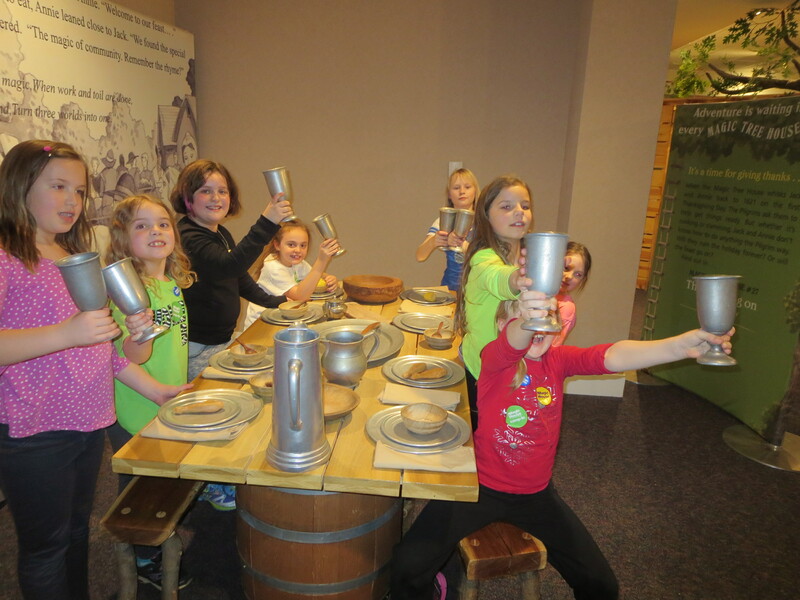 Next, girls watched the award-winning movie, Cahokia: City of the Sun and then explored the museum. Storytelling with Marilyn Kinsella followed with her telling the legend of the origins of light and darkness. Not a peep was heard until after she concluded her time with instructions on how to make a bracelet out of jute. Our final session involved our returning to the auditorium where an archaeologist showed us various Native American tools, how they were crafted and where they were found. Learning soil color and striations matter when excavating, the girls put this knowledge to the test with their snack. Girls created their own “soil” layers with chocolate pudding, vanilla pudding, cookie crumbles, Gushers as “evidence,” chocolate sprinkles, and a gummy worm on top. Given new energy, the girls then drove (me) or walked (others) across the street to Monks Mound and climbed the stairs, some more than once (not I). 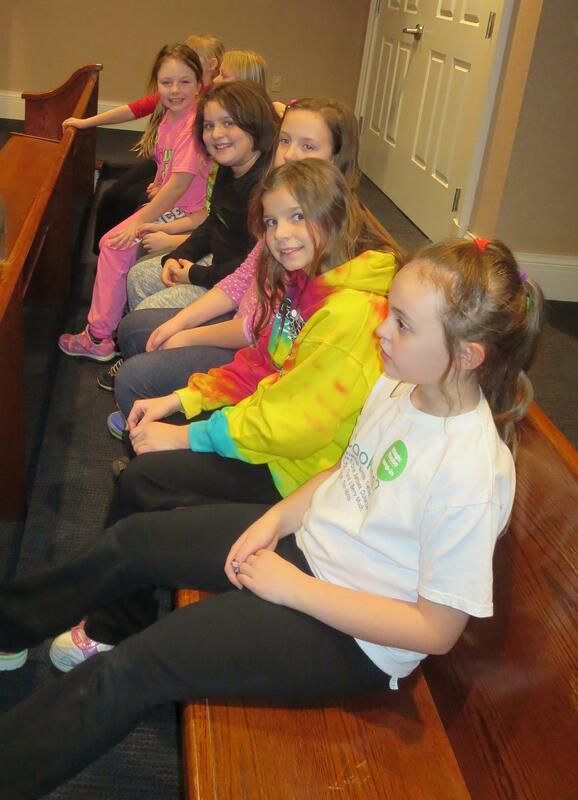 This is most definitely a field trip worth taking, and one I think our Brownies will remember for a long time to come. Interested in four hours of nonstop playful learning for your third grader (or Brownie or Junior Girl Scout) followed by a slumber party? Then, a Wintertime Blues Camp-In is just right for you. 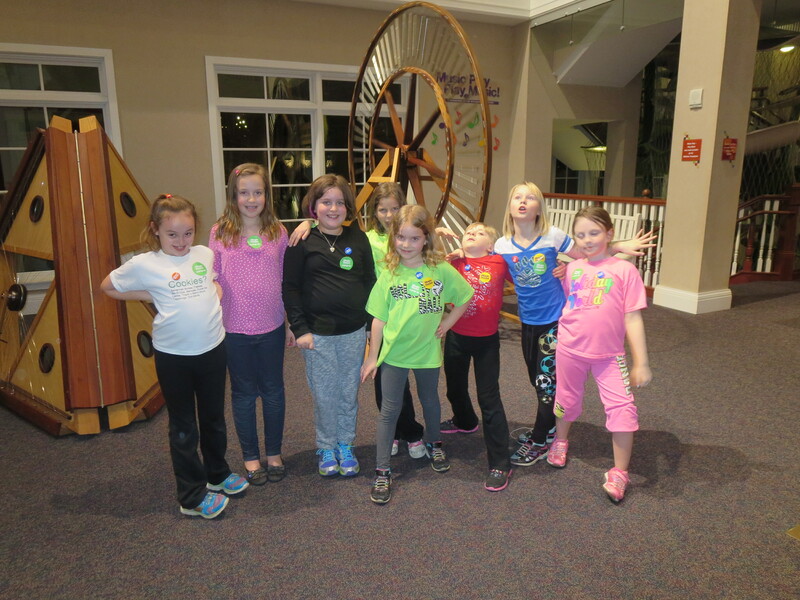 Arriving at 8 p.m. at The Magic House in Kirkwood, Missouri, our Brownie troop checked in, dropped off our gear of sleeping bags and pillows, and were then let loose in The Magic House for an hour of free play. Think the Kracken with an endless supply of energy unleashed x10. 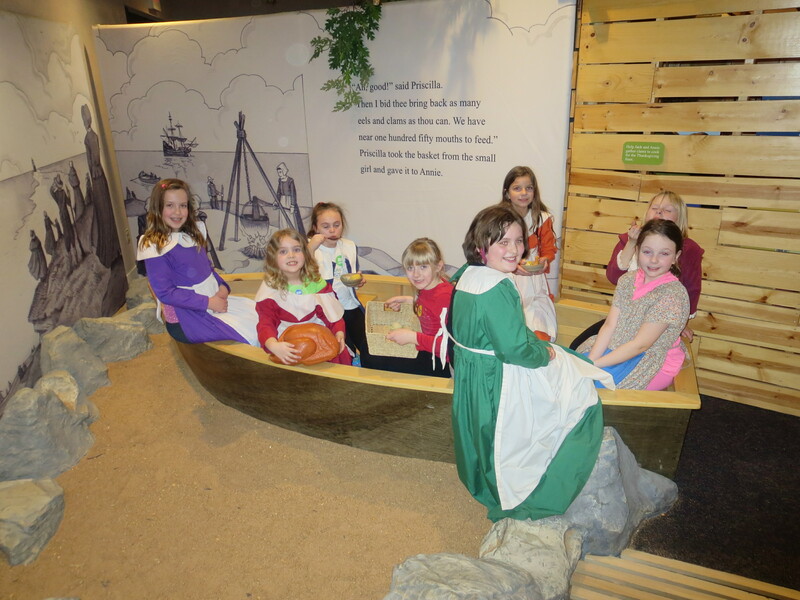 Yes, young girls given free reign in this 55,000 square foot children’s museum. The result . . . laughter, wide eyes, perspiration, hurried movements, and exploration due to such activities as fishing, cracking bank vaults, rocking babies, shopping for groceries, and climbing the beanstalk over and over and over and over again. Time out . . . I need a minute to catch my breath. After an hour passed, stinky bodies (okay, my stinky body) gathered in the legislative branch to hear our instructions for the evening from our young, energetic facilitators. Directed to our snack of pizza and beverage, we were then assigned our Scavenger Hunt to complete as a team for a special prize. Passing this task on to our former Cookie Queen, Miss Toni guided the girls from room to room in order to discover answers to such questions as, “How many yellow balloons are in the Conservatory?” When all questions were completed, the girls hustled to the front desk so that their answers could be graded for completion. Discovering an incomplete response, the girls hustled back downstairs in search of the correct answer. I, on the other hand, decided to hold down the fort right where I was. 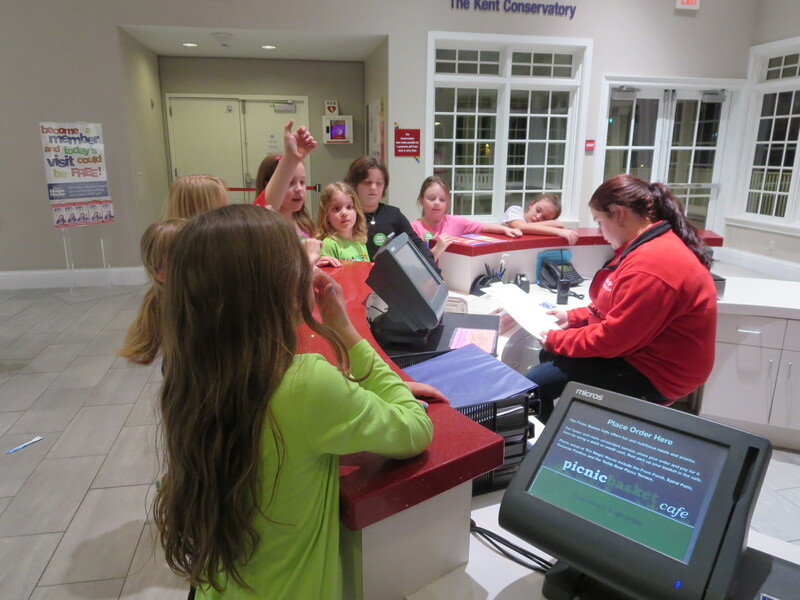 With another climbing of the bean stalk under their belts, the girls returned to the front desk in order to retrieve their prize, a colored pin of their choosing with The Magic House logo. 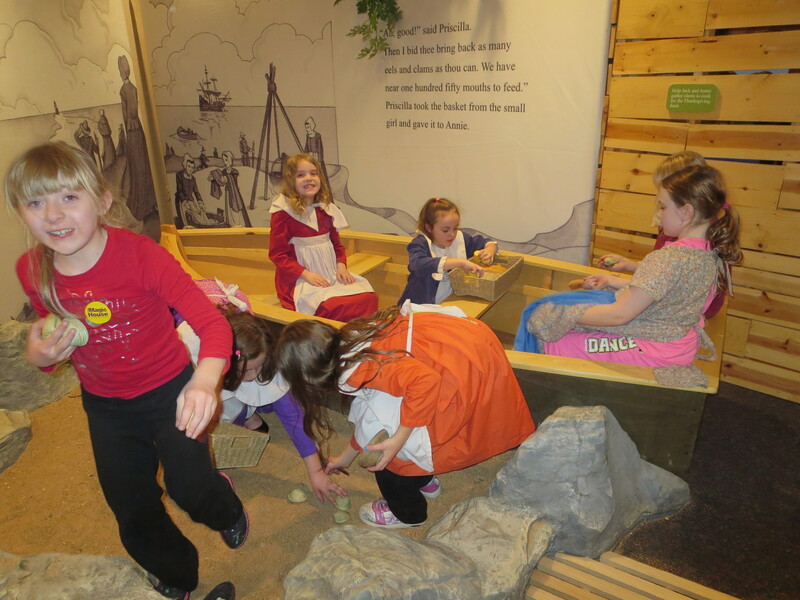 Allotted further free time to play before our assigned Art Class at 10:30 p.m., the girls spent a great deal of time in the special exhibit, Magic Tree House, based on the children’s book series by Mary Pope Osborne. By the time Art Class rolled around, I was beat. Finding a place on the carpet, I rested my head on my Rapunzel backpack while instructors led the girls in Simon Says before leading them in a stamping project. Once again granted free play until our 11:30 p.m. settle down and make camp time, the Brownies played in frenzied delight while I found a chair with a back in a corner of the bank where I observed robberies, deposits, and overall Magic House mayhem. Grateful when it was time to roll out the sleeping bags, my squirt staked claim on a closet for us to sleep in our designated area (insert forced “Woo!” here). With the sound of steady snores and gregarious giggles in the background, I actually drifted off to sleep until close to our 7 a.m. wake time. With a doughnut in each of our bellies, we exited the building with our much deserved patch in hand (it’s hard work earning a fun patch) and our carelessly folded baggage under our arms. Silence ensued on the ride home as I dreamt of an actual bed in which to rest my weary forty-three-year-old body whereas, I am sure, my squirt and her fellow Girl Scouts remembered fondly, then and for a long time to come, the previous night’s events at this house filled with much magic. 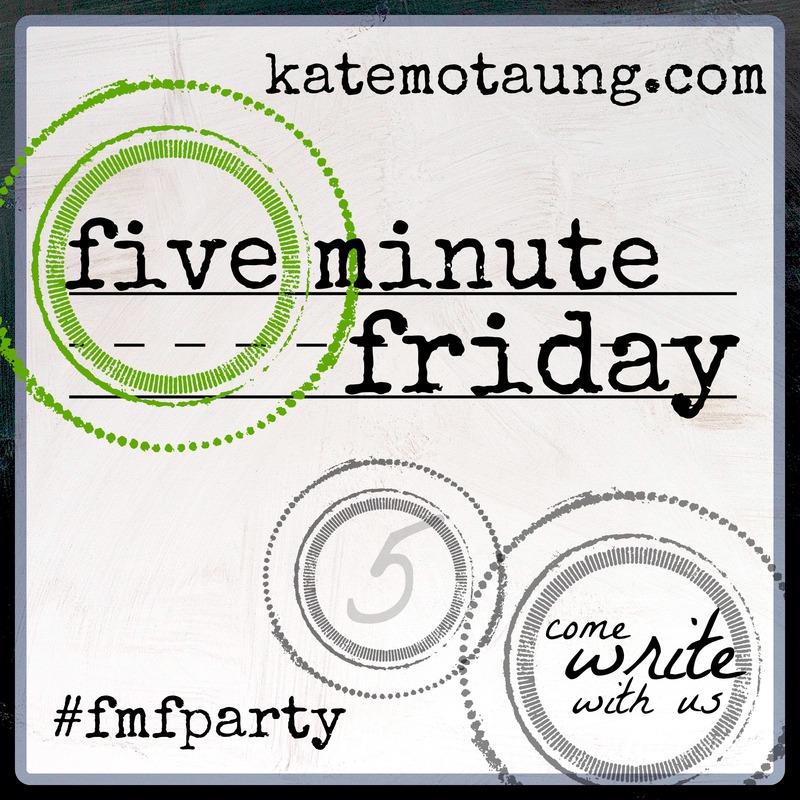 *This post is dedicated to the fearless Mommas who survived a night at the museum. Get Your BBQ on at Beast Craft BBQ Co.
Reading through the Belleville News-Democrat last weekend, I came across a mouth-watering article by Teri Maddox about Beast Craft BBQ located at 20 South Belt West in Belleville, IL. With my hub and now girls being lovers of bar-b-que, I knew we needed to taste for ourselves. Although breakfast is offered on the weekends at Beast Craft BBQ, we knew we wanted to first try their lunch menu. 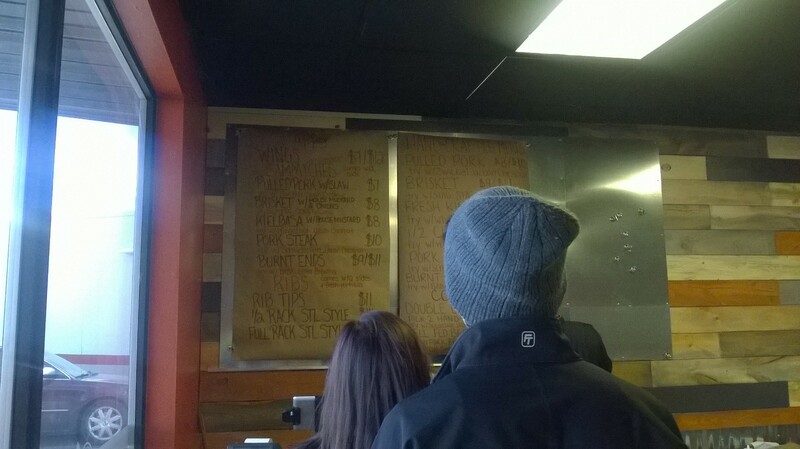 Arriving ten minutes before lunch, we anxiously awaited the kraft paper menu change on the board by the owner David Sandusky. As we read the menu which changes daily, the people in line behind us grew and grew and grew. Having read about the roasted Brussels sprouts with pork belly prior to our visit, I was like a kiddo in the candy shop when I saw it was offered on today’s menu. The hub also opted for the sprouts as one of his two sides to accompany his entree entitled, Well-Fed Beast, a platter consisting of pulled pork, kielbasa, rib tips, and brisket. Our two young girls ordered the ribs with hand-cut French fries and one chose a banana as her second side while the other chose blueberry yogurt. Yum! 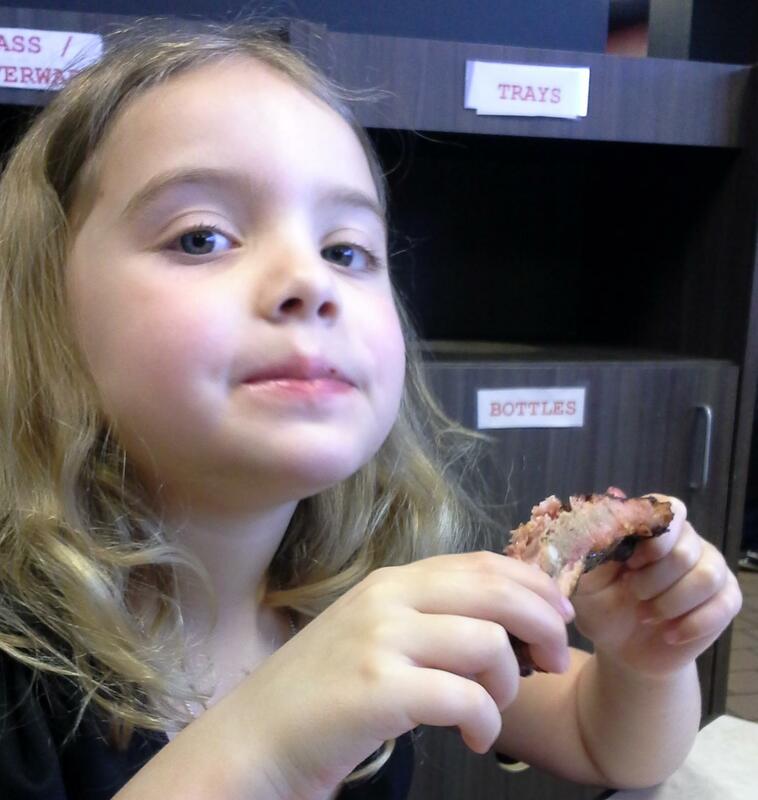 For my oldest daughter, this was actually her first attempt at eating ribs. Her reaction, “They [the ribs] are much better than chicken legs!” and, believe me, she loves her chicken legs. Although there was a wait, the friendly staff repeatedly checked in on us. My oldest urged me to ask if their sauce, a beautiful near transparent blend, was for sale as we dreamed of making sauced meatloaves and chickens at home. Not yet, we were told, but hopefully coming soon. Besides the breakfast menu option on weekends, the sauce alone is enough reason for us to visit again sooner rather than later. Bummed about my oldest daughter not having art in her curriculum this year, we are always on the prowl for opportunities to create. While in the waiting room at the eye doctor, I saw a segment on Show Me St. Louis highlighting Yucando, an open art studio in Webster Groves, Missouri. Score! Walking into the studio, we were immediately greeted by a welcoming art teacher who offered us a tour of creativity from which to choose ranging from jewelry making to mosaic to painting to paper crafting. My youngest made a beeline for the paper mache pig to paint while my oldest selected a picture frame to paint and embellish with flowers. Overwhelmed by supplies housed under one roof, I opted for a magnetic board which required my fabrication of magnets. 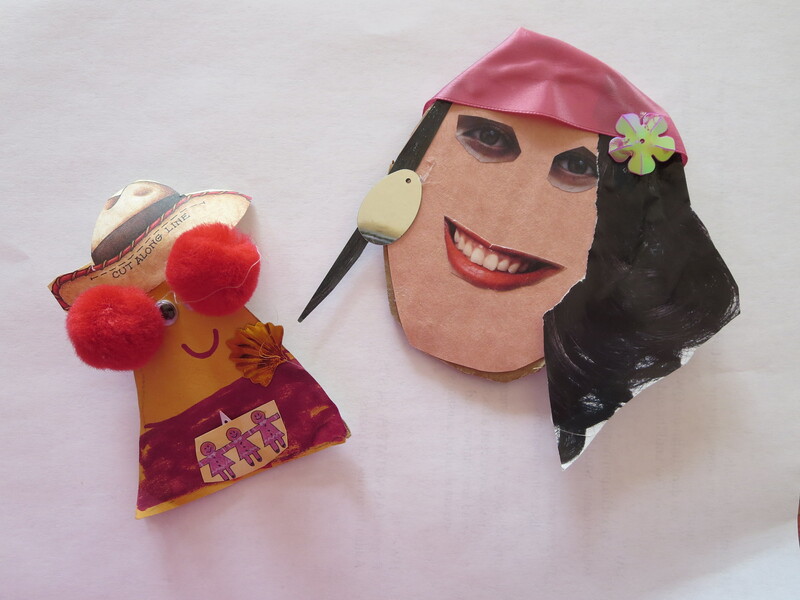 The girls painted and dried their creations before sealing them. I lost myself in the paper section of the studio where I selected words from a vast selection of old books. After nearly two hours of studio time, we were famished so we walked across the street to the First Watch Cafe to restore with biscuits and gravy, French toast Monte Cristo, and a grilled cheese. Yummers! Fulfilling our New Year’s resolution to experience more, we are looking forward to a return visit soon in order to crEATe in Old Webster. Jacoby Arts Center. 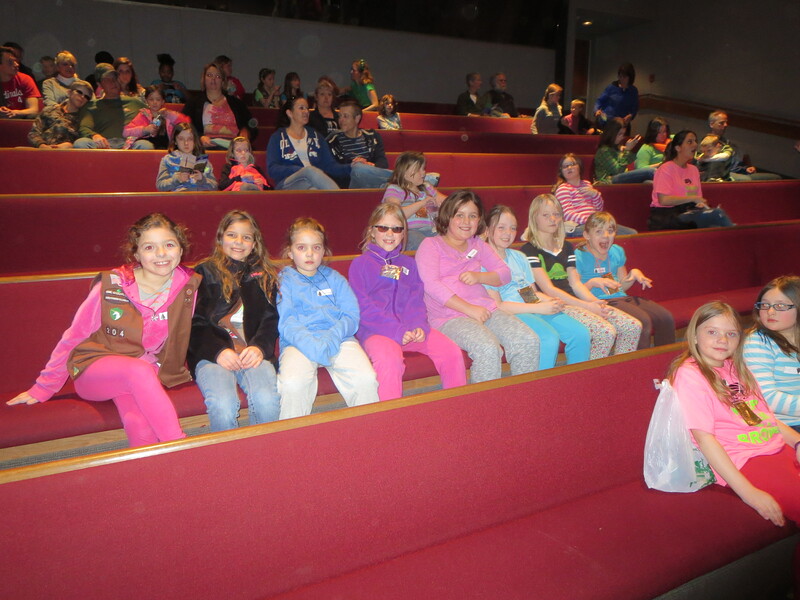 Our Brownie troop had a field trip this past Saturday to the Jacoby Arts Center located in Alton, IL. Without a doubt, this is one inspiring nonprofit arts center. Entering the historic building we immediately saw rows of decorated bras hanging on the walls of the gallery. As a breast cancer survivor, I knew I was home. That evening the Jacoby Arts Center along with Alton Memorial Hospital hosted Bras on Broadway, an exhibition of art bra creations to benefit Alton Memorial’s breast cancer support program, You’ve Got a Friend. Our third-grade Brownies enjoyed viewing the themed bras and selecting their favorites; my Brownie was partial to the Wonder Woman bra since this was who she chose to be for Halloween. I gravitated towards the sequined bra which must have involved a LOT of gluing. Making our way downstairs for our BeJeweled class, we met Ms. Susan Elmendorf, a knowledgeable teacher who held the girls’ interest and encouraged their creativity from start to finish. The first project consisted of creating a brooch out of magazines, ribbons, sequins, and construction paper. The results truly exemplified inspired thinking outside the box. The next project involved working with clay in order to create enough beads for two bracelets. Again, the sky was the limit as to bead formation. Ms. Elmendorf stressed the importance of carving tool safety with much humor and explained the mental and physical benefits of working with this medium. Soon moms, dads, and grandmas were joining in on the handiwork. With all of the collaboration happening, I thought I might have heard Unchained Melody in the background. As a requirement for earning the 3 Cheers for Animals Girl Scout journey patch, Daisy Troop #48 donated items to our local animal shelter. With a trunk full of dog food, paper towels, and bleach, we headed to The Metro East Humane Society (MEHS) located in Edwardsville, IL. Upon arrival, we were greeted by a friendly, informed young man who brought a cart to our trunk in order to ease the unloading. Once inside, he suggested a picture be taken with our donations. Three Daisies, Miss Ava, Miss Piper, and Miss Colette, and assorted siblings gladly smiled for this photo opportunity. We were then granted full access to the kennels housing the dogs in need of adoption as well as the cats and kittens. Not a dry eye was had by any one of the mommas on the tour. The sight of animals desperate for loving homes definitely pulled at our heart strings. 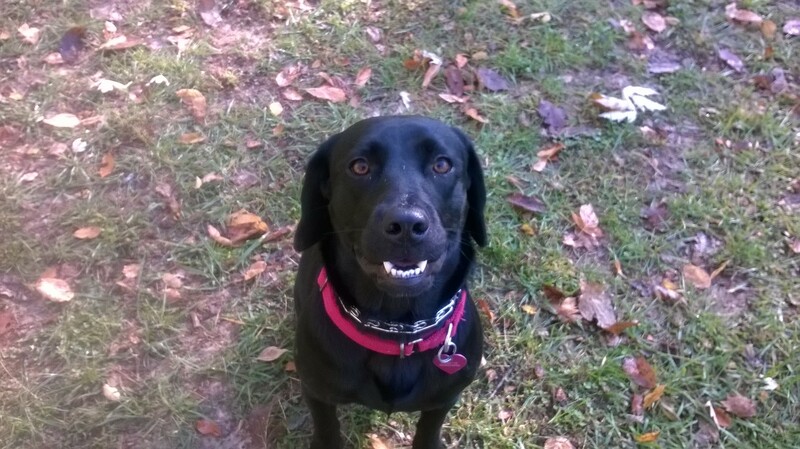 Personally, I lingered in front of Chloe, a lab mix, far too long (according to the hub’s head shakes) to the point where I imagined she would make an ideal playmate for our Daisy. . .
Before exiting we asked the two workers specifics regarding the animals at this no-kill shelter. 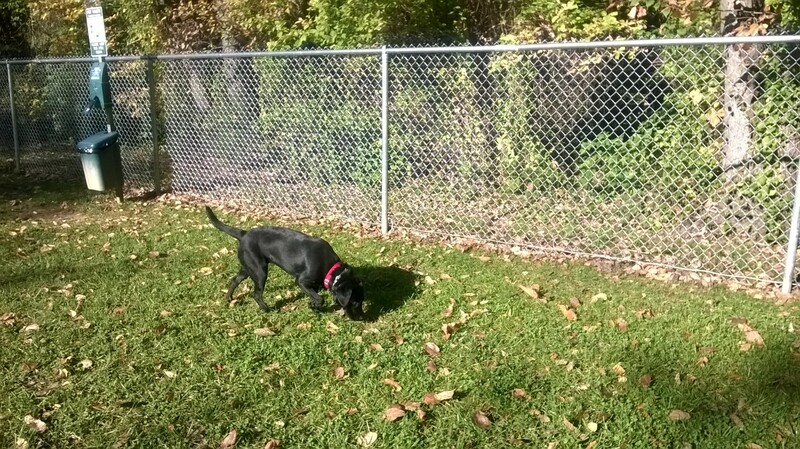 Thrilled not only with the cleanliness of the facility, I was relieved to learn canines are walked and given time for play on a daily basis. If pet adoption is on your mind, consider an animal rescue where furry friends need love. If feeling the urge to volunteer, consider an animal rescue which is always in need of volunteer walkers. If looking to donate, please consider an animal rescue. You will be glad you did. 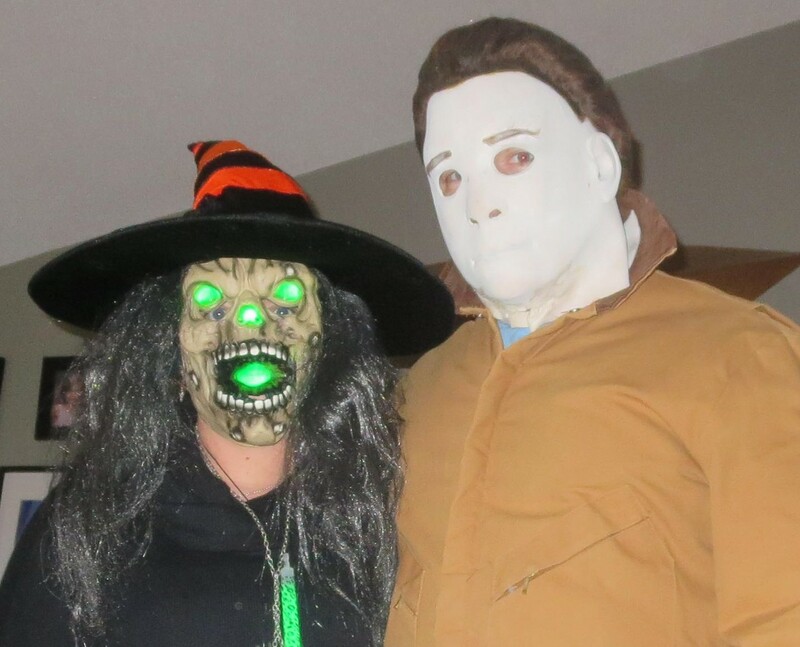 Oh, the weather outside is frightful, and this is just the way my hub, Michael Myers, and I like it when it comes to Halloween. 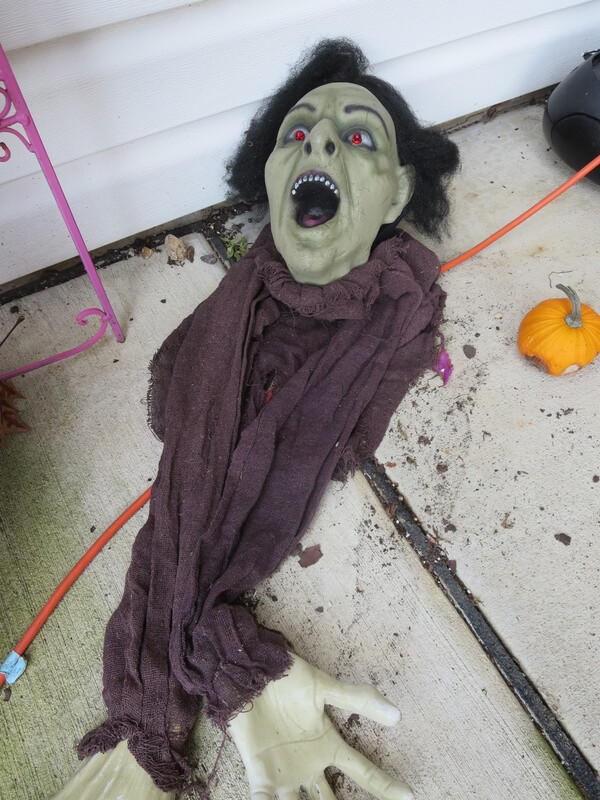 Our teen neighbor joins in as we attempt to scare the local kiddos on their hunt for candy. This year the hub constructed a black screen on our porch to block the trick or treaters’ view of the bucket of candy. They had to pass through a gate, walk past a moving witch, and then peer behind the blackness. Hey, we like to make squirts work for their treats. Today fellow parent volunteers and I are scaring the first-grade students in my daughter’s class with an Ooky Station complete with dried ears (pig ears), tongues (dried apricots), fingers (turkey jerky), bloody intestines (spaghetti with sauce), warts (raisins), bloody skin (lasagna noodles with sauce), eyeballs (garlic-stuffed olives), and bones (thick pretzel sticks). Needless to say, Halloween is by far my favorite. Tonight we will Tent or Treat at Troy United Methodist Church, and tomorrow once kiddo activities are complete, we will shop the bargain racks at spooky stores in search of ideas for next year’s celebration. On May 17 of this year, I woke up to frozen socks. I was prepared for a lot of things on the trail–mosquitos, hunger, a broken shoelace–but I hadn’t anticipated frozen socks. A winter of heavy snow and frigid temperatures coupled with a late spring where I was hiking in Minnesota meant for a very wet trail, so my socks were going to be wet no matter what. I needed to keep my second pair of socks dry in case of hypothermia, so I warmed up a little water on my camp stove, poured it into a Ziploc with my frozen socks, and waited for them to thaw out. Putting them on that morning and getting my feet into mostly frozen shoes was a most uncomfortable sensation, but cold, wet socks became part of my daily routine over the next weeks as I thru-hiked the 300-mile Superior Hiking Trail in northern Minnesota. Every backpacker has heard the questions. “Have you read A Walk in the Woods? What about that Wild book?” Maybe you’ve read them, too, and have been thinking about heading into the woods yourself, but those books won’t give you a great idea of the day-to-day life of a backpacker or prepare you to go into the woods, especially alone. A quick look at those books will show you that most pages are about something other than backpacking. Like any good book, those books are about people–their dramas, their emotions–but there’s relatively little actual backpacking in either book. They do, however, speak to the power of words to motivate action. With both Wild and A Walk in the Woods coming out as movies in 2014 and 2015, respectively, backpackers on the Pacific Crest Trail and the Appalachian Trail are anticipating even more people on the trails after their release. If you’re thinking about becoming one of those backpackers or even just a day hiker, here are a few more practical bits of advice that you won’t find in those books. Communicate your plans. You don’t want to end up in a situation where you have to cut off your own arm because you didn’t tell anyone where you’d be or when you were expected to return (See Between a Rock and a Hard Place or the film version 127 Hours). Stay within your physical capacity. If that means starting off with a 2-mile hike, then do that. You’re probably capable of more, but being conservative and staying well within your physical capacity means that you’ll have some energy left if you do get into a bad situation or end up having to go farther than you’d planned. This is especially true if, like me, you hike alone. Carry what you need. The Ten Essentials is a good list of basics that will help keep you safe. I carry these things even on short day hikes because you never know when a sprained ankle will keep you in the woods far longer than you’d planned. But don’t carry too much. If you’re planning an overnight trip, your pack weight will have a lot to do with your happiness on the trail. That doesn’t mean that you should go out and buy the latest and greatest ultralight gear (although shopping for that gear can be fun!). The lightest things you carry are the things you leave at home. You don’t need a different outfit for each day or a full set of pans or an extra pair of shoes or a whole bar of soap or an 800-page novel. Leave those things home to lighten your load. Train. If you’re planning a longer trip, your body will thank you if you train. Get some miles on your legs and some callouses on your feet before you head out for a long trip. You’ll enjoy yourself more if you aren’t fighting blisters or sore muscles every mile. Finally, moderate your expectations. Most people who head out on trails do so as a way to escape everyday life. The trail can definitely help you get away (I told more than one person that my trip was an escape from my email), but no matter where you go, there you are. If you’re dealing with personal issues, those aren’t going to magically go away just because you are outside. Some people find mental clarity on the trail, but in my experience, you’ll spend most of your time thinking about the location of your next water source, how much food you have left before your next resupply, how to keep mosquitos and ticks away, and how much daylight you have to get to the next campsite. Walking, eating, and sleeping will take up most of each day, so if you want to spend time reading or writing, you may have to schedule them in just like you do in your regular life. However, there are a few additional logistical complications. For reading, I decided not to carry a book because of weight, but I did carry an extra battery for my phone so I could read using the Kindle app. I ended up reading about one book per week on the trail this way. The Immortal Life of Henrietta Lacks had been on my reading list for a while, so I worked my way through it during the first few days on the trail, but I soon moved on to three books by Minnesota author Ken Nerburn based on a quick flip through the pages of Neither Wolf Nor Dog. I liked the idea of reading an author whose work had been written near where I was walking, and the themes of nature that thread through his books on Native Americans were an appropriate accompaniment to my Minnesota hike. For writing…well, I didn’t really write while I was on the trail. I took a pencil and small notebook and took a (very) few notes here and there, but I didn’t do any concentrated writing. After so many years of writing on a computer, I find it difficult to write long-hand. While I did think I’d want a written record of the trip and have compiled such records in the past (most extensively for a cross-country bicycle trip in 2006), I recognized that this particular trip was about me experiencing the trail without significant reporting or reflection in the moment. In some ways, backpacking is simply less interesting than bicycle touring in terms of immediate storytelling potential because I met very few people. Also, since I wasn’t dealing with any intense personal drama like Cheryl Strayed, I just had little to write about in the moment. If you do plan to write on the trail, I know some backpackers get an external keyboard to use with their phone, but I didn’t think I’d use it enough to make it worth the extra weight and thought it would use up too much battery anyway. If you want to write a lot, a keyboard may be worth it, but remember that you’ll mostly be typing in your tent, so try out any set-up sans table before you commit to carrying it on the trail. While I didn’t write a lot, I did take a lot of pictures. You can see the best here! 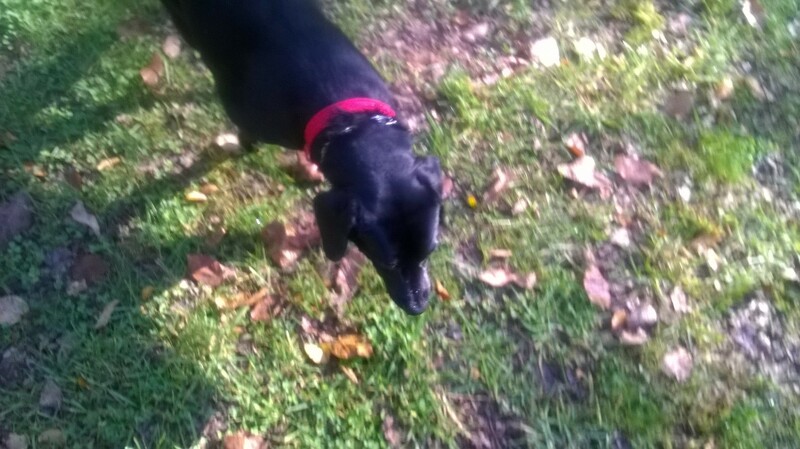 While on our morning walk, Daisy and I decided to explore the Bark Park at Miner Park. Located behind the Glen Carbon Centennial Library among mature trees, a baseball diamond, and two playgrounds, we wound our way on the paved path to the entrance. Relieved no other dogs were present as we are on a strict no-sniff policy, an aspect of dog training learned at Cindy’s Critters. 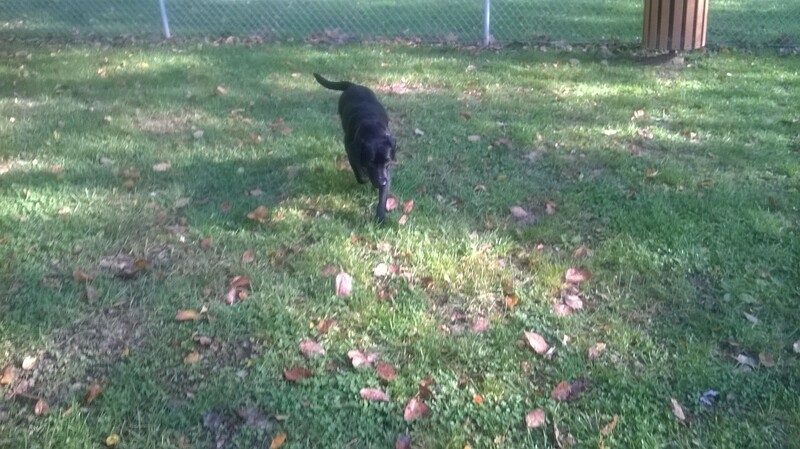 Inside the chain link fence, we discovered grass void of any “boom booms” as my girls label number two deposits. Refreshing! 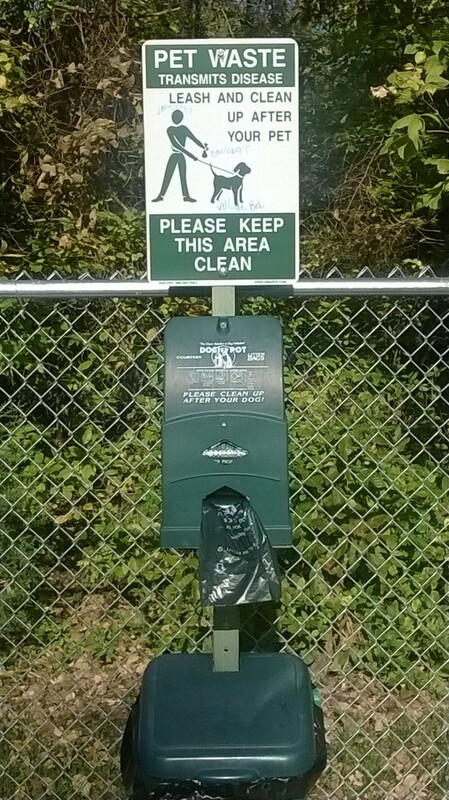 Rules are clearly stated on the entrance gate, and the Bark Park supplies bags for clean-up as well as a conveniently located trash receptacle. 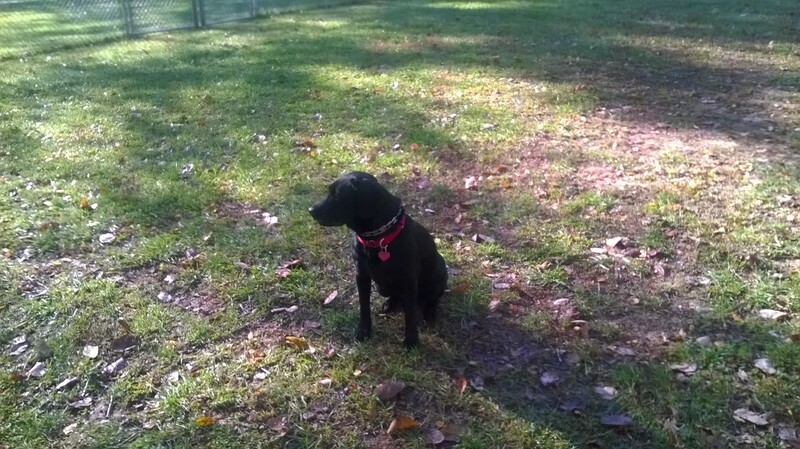 After a time, I put her back on the leash so that we could complete our fifteen minute daily training homework assigned by Master Dog Trainer/Behaviorist John Dahman of Animal Specialties. We have almost mastered the sit and stay with only two classes under our belt. Oh yeah! 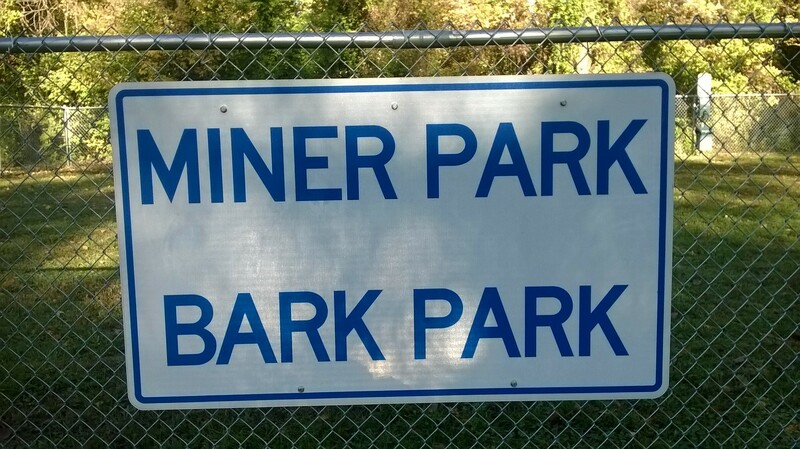 So, if you are a dog lover looking to explore a dog-friendly park with your four-legged best friend, be sure and visit Bark Park at Miner Park, a definite two-paws-up park.